Today, I decided to head out to Jamaica Bay Refuge for a day of birding. My plan, was to start with the South and North Gardens on the West Pond Trail, to look for migrating warblers and then head out to the North End of the East Pond. The day got off to a good start; as soon as, I ventured into the South Garden, I saw yellow warblers, followed by a number of American Redstarts, Hairy Woodpeckers, Carolina Wrens, and Common Yellowthroats. From there, I headed out to the North Garden, where I saw more Redstarts, A Black-and-white warbler and a Blackburnian warbler. I decided to walk the rest of the trail around the West pond back to the visitor’s center. As I got to the center, I deviated off the trail to the South Gardens once again to see if I could see any new action and I did…I saw a Philadelphia Vireo. During my break for lunch I ran into Lloyd Spitalnik, Cal Vonberger, and Don Riepe who are well known birders and photographers. Cal and Lloyd, indicated that they were heading over to the North end of the East Pond later in the afternoon. Since, I had planned on heading that way I decided to tag along with them. Once at the site, we were told that there was a juvenile Wilson’s Phalarope in the area and so we trekked around the edge of the pond in the mud, in search of the bird. We were in luck, as we came across the subject around Sanderling point. The guys took up their spots and went to work photographing the Wilson’s Phalarope and other subjects. We also, saw a number of White Rumped Sandpipers, Stilt Sandpipers, Lesser Yellow Legs and some Short Billed Dowitchers. 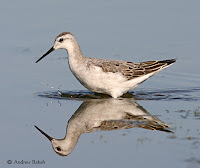 On the way out, we got better shots of the Wilson’s Phalarope and also saw Western Sandpipers. Lloyd and Cal were very down to earth and displayed none of the “air” of know it alls. In fact, Lloyd was really cool in taking his time out to explain how to identify “Stilt Sandpipers”…this was very much appreciated since Shorebirding is relatively new for me. All in all, it was a decent day. Here are some photos that I took from my birding. The Goldfinches are still here along with the Veery, Warbling Vireo, Warbling Vireo, Alder or Willow Flycatcher, and the Ruby Throated Hummingbird. These visitors, coupled with the usual species makes it good birding for a small backyard in Queens. Here are some pictures. This afternoon around 2:46 PM, I looked out into the backyard and saw a Yellow-Billed Cuckoo on the flowering dogwood (Cornus Florida). I quickly grabbed my camera and was able to capture the bird just as it was taking off. Alder or Willow Flycatcher...very tough to call. I think this is a Warbling Vireo. A Veery, member of the Thrush family. 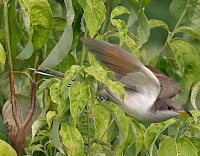 Yellow-Billed Cuckoo on the Flowering Dogwood. August has set the bar...could it get any better in September? All Spring through Summer I was looking for a Ruby Throated Hummer that I had seen over the past three years. Well, today makes it four years in a row as a Female Ruby Throated showed up at the feeder; what are the chances it is the same bird? Also seen today was a Sharp Shinned Hawk in the backyard, which caused all the birds to quickly disperse. Here is a photo of the hummer at the feeder. Visitors to the backyard continue to pick up. New bird arrivals include a Veery and Philadelphia Vireo; I have also noticed a Black Swallowtail and Spicebush Swallowtail butterfly visiting the Lantanas and Butterfly bushes. I will try and get photos to post them later. 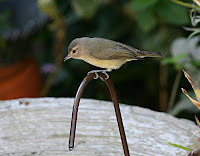 Here is a photo of the "Warbling Vireo" at the birdbath. Warbling Vireo on a dripper at the birdbath. I Looked out into the backyard this afternoon and spotted what looked like some type of Vireo; a photo and validation from the folks on Birdforum confirmed that I had seen and photographed a "Warbling Vireo." The first such recording in the yard, so my backyard list just increased. Sweet!!! I wonder if September is going to top August! 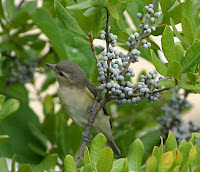 Warbling Vireo photographed in the backyard. Today, I attended the much anticipated Shorebird Festival at Jamaica Bay. The festival, the third since its inception is a venue where well known birders give presentations and lead bird walks for birders of all skill levels. The event is hosted by the American Littoral Society with support from the New York City Audubon and The National Park Service. I attended as a volunteer assistant to Don Riepe on behalf of NYC Audubon Society and the National Park Service. This year’s presenters included Don Riepe (Jamaica Bay Guardian, Naturalist, Birder and Photographer), Kevin Karlson (Naturalist, Birder, Photographer and Co-Author of “The Shorebird Guide”) and Lloyd Spitalnik (Naturalist, Birder and Photograhper). I got to the refuge center at around 8:10 A.M. and found out from Don, that the strategy was to break everyone into groups consisting of beginners, second level and those who considered themselves experts birders. Don and I took the beginners group and together about 15 of us headed out on to the trail that covers, the West Pond. During our walk we saw, Kingbirds, Tree Swallows, Catbirds, Mockingbirds, Great Egrets, Mallards, Mute Swans, Yellow Crowned Night Herons, Black Crowned Night Herons, Least Sandpiper, Black Swan (an escapee from some unknown location), Gulls, Glossy Ibises, Yellow Billed Cuckoo, Brown Thrasher, Oyster Catchers, Snowy Egrets, Semi-Palmated Pipers, Cormorants, Ospreys, Canadian Geese, Carolina Wrens and a Downy Woodpecker. At around 10:30 we headed back to the visitors center where I met Erik Karff who works for the NYC Audubon and was in attendance to showcase some of the upcoming programs. Don did his presentation, which covered a bit of history around Jamaica Bay. Don is an excellent narrator and his presentation was really good including his photography which earned him many compliments from the audience. Don was followed by Lloyd Spitalnik who also had a lot of really nice photographs to share. Lloyd’s photography was very impressive and had many in the crowd murmuring in appreciation. Around 11:30 or so, we broke for lunch. I had a quick bite and decided to head out on my own to Big John’s pond, where I saw the following: a couple of Solitary Sandpipers, Lesser Yellow-Legs, a Great Blue Heron, Northern Cardinals, Catbirds, an Eastern Towhee, Yellow Warblers, a Northern Parula and a Semi-Palmated Sandpiper. Not too shabby for a half an hour visit. Then, it was back to the visitor’s center, where Kevin Karlson did his presentation, which I was keen on seeing because Kevin had indicated to me earlier that he was going to cover identifying techniques including structure. I was not disappointed; it was an excellent presentation and left me wanting more. I took many notes and cannot wait to apply what I learned. After Kevin’s presentation, we headed out to the North End of the East Pond, which is over by the North Shore Bridge. Some folks dropped out at this point because birding on the North Shore requires boots/waders as it is pretty muddy. Some of the birds we saw included, Stilt Sandpipers, Short Billed Dowitchers, Pectoral Sandpiper, White Rumped Sandpiper, Semi-Palmated Sandpipers, Rudy Turnstone, Black Bellied Plovers, Gulls, Canadian Geese, and Mallards. There were reports of Red Knots, but a Peregrine Falcon apparently drove them off and we did not see them return…at least for the time I stayed there. All in all, it was a fantastic day and I look forward in anticipation to the Third Shorebird Festival. Here are some birds I photographed on my walks. 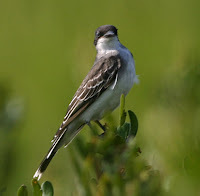 Kingbird sighting on the West Pond trail. 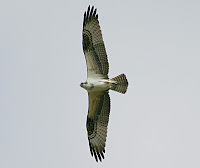 Osprey overhead on Terrapin Trail around the West Pond. Lesser Yellow-Leg at Big John's Pond. Solitary Sandpiper at Big John's Pond. Yellow Warbler at Big John's Pond. Rudy Turnstone at the North End of the East Pond. Stilt Sandpipers and Short-billed Dowitchers at the North End of the East Pond.